This is certainly one of the more spur-of-the-moment trips that I've taken (I'm lucky to have a Scott with such a spirit for spontaneity!). We'd driven up to Johannesburg for Mitch and Nina's wedding and decided that we'd drive back to Cape Town via Botswana and Namibia. We've been loosely day-dreaming about doing an epic road trip through some southern African countries for a while, and now was a good time to have done this because up till now Scott's been busting his chops till between 2 and 3am working on an amazing site called Cargoh and it launched the day before we set off. 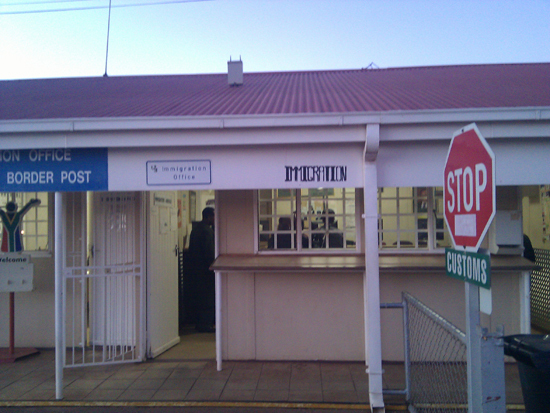 Crossing the border at Pioneer Gate into Lobatse was fascinating. We had no idea what to expect and had braced ourselves for a very "African" experience. What we actually experienced was a pretty laid-back, surprisingly efficient and extremely friendly set of border guards. The facilities were small-town rural but clean and quite cute. This is a photo that Scott took on his cellphone of the hand-painted Immigration sign up at the office. This trip is a milestone trip for me because I have never been to any of the countries surrounding (or surrounded by) South Africa. The surprising part about it is that from Johannesburg it is quicker to drive to Botswana than to Durban where our family would take coastal holidays every year. In fact, hardly any Johannesburgers that I know (and I know a few) have done this drive. More than anything we're just dipping our toes into the water here to learn about what there is in Botswana (there's a lot as it turns out) and where we like to be, and I'm certain that we'll be returning in the not-too-distant future with a more appropriate and less conspicuous vehicle. The people are hands-down the friendliest people of any country that Scott and I have ever been to. I mean like seriously, uncomfortably friendly. When we first got here, I thought that the young girl who bounded up to me and asked to have her photo taken when she saw me taking a picture of The Braai Place was trying to rob and/or con me. She wasn't. She was just that friendly. They use British-style wall plugs. Crap. We have had to purchase yet another adaptor plug. This country is serious about its crackdown on the HIV/Aids epidemic. Every single hotel that we've stayed at has come with condoms in the draws next to the bed. The primary school in the village that we visited in Gweta had a billboard right as you enter talking about HIV/AIDS. I think we're all reaching saturation point on the social network front. Most of us are by now signed up to more of the things than what we can feasibly manage and gain value from and lately I've felt like it's time to start paring them down to the ones that are of real use to me. It can be challenging to debate on Twitter with its 140 character limitation. 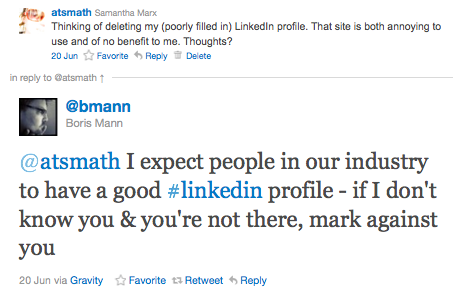 "If I don't know you and you're not there, mark against you" - if you don't know me, you probably aren't going to be looking for me on LinkedIn anyway. You're probably going to google me or something relating to me (eg Drupal), not so? Anyway, it wasn't only me - there were other people who felt the same way as I did. I value Boris' opinions highly but this time I had to disagree. 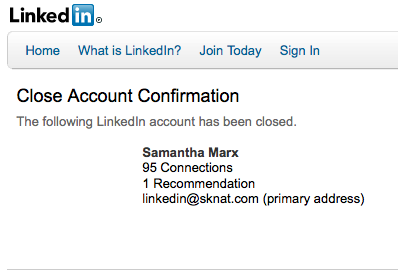 I can't come up with a single reason why I need an account on LinkedIn, and frankly I find the site annoying. It annoys me that after I've accepted someone's contact request via email I then have to then login to the site if I want to do anything else. It annoys me that no matter how many times I login, it does not leave me logged in on my own computer. And most recently it annoyed me that the company added fields into the My Account section where it auto-opted me in to share my information with 3rd parties and affiliates, and subscribe me to emails, without ever letting me know. Facebook has a bad reputation for this stuff but when I looked through LinkedIn's account information the other day I was shocked. It was as bad as anything Facebook has ever done. But! there is one more very important point that makes me absolutely not trust them. I'm a little ashamed to be admitting this part because it involves me having done something stupid: when I first signed up for LinkedIn a few years back they had this handy "Find your contacts from Gmail!!!" feature. Usually I am so cautious and careful about stuff like this but in a moment of stupidity I decided that it seemed like a good idea and I entered my Gmail username and password for it to auto-discover Gmail contacts of mine that were on LinkedIn. Idiot. Anyway - this was in about 2007 or 2008 I believe. Since that time I have removed all traces of that email that I could find on LinkedIn and changed my login details (on LinkedIn) so that it was using a different email account, yet to this day each time that I have logged into the site it has shown me in my list of "People You May Know" contacts that I did not meet and exchange email correspondence with until much later. One such example is the managing agent for the apartment that Scott and I bought in the middle of last year. So what is it that am I claiming exactly? I'm claiming that LinkedIn has stored my gmail username and password on its server and without my permission continues to login and access my personal information. The only explanation for how it would know to recommend people like my managing agent to me (people who I am not connected to on ANY social network and have only actually had dealings with via email, and who I've only had dealings with in very recent times) is if it has stored my details and continued to access my email. Please - someone prove me wrong about this, because I am disturbed. And in the mean time I am really pleased to have shut this account down. A little while ago I was fascinated by a post I read on the BBC website with a list issued by the British government of their banned buzzwords. I spent about an hour last night catching up on some of my RSS feeds (which have fallen badly by the wayside since I've been helping Nee out with her wedding preparations) and design blogger Swiss Miss had a post to a fantastic New York Times blog post in the same vein called Words We Don't Say by Hugo Lindgren. 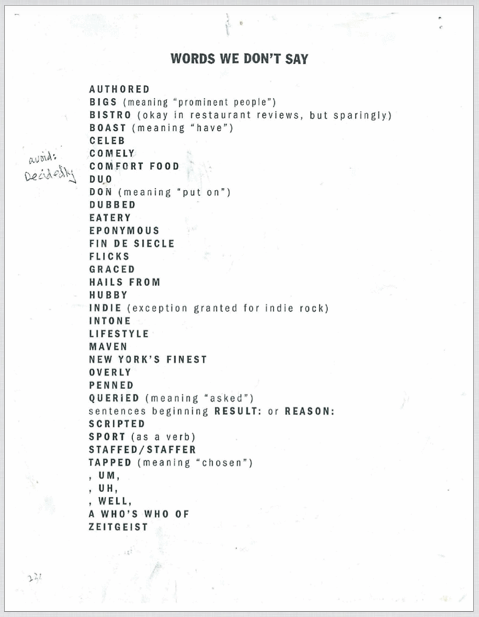 According to Hugo Lindgren this list is from 1977 at the latest, which was when he started his position at the newspaper, and yet fascinatingly almost all of the words on this list could be applied to a banned-words list of today. I like the comments on the article which suggest some more words: decidedly, going forward, utilize (omg I completely agree!! ), however, arguably, impact, reach out to (instead of contact), and decidedly. 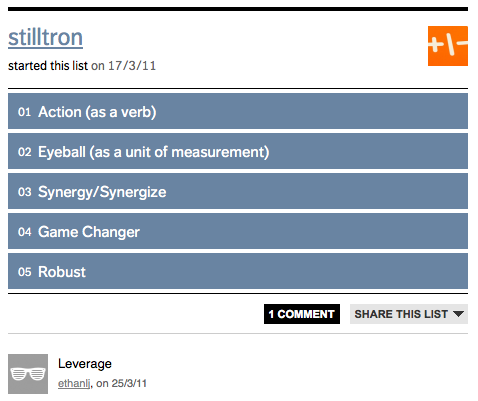 Also via SwissMiss I browsed over to a brilliant site that appeals strongly to my desire for order: ListGeeks. The homepage is made up of a grid of various lists by users (eg favourite smells, movies they want to see etc) and one lovely list screamed out at me: Terrible "Corporate Speak" Words by stilltron. A few weeks back, Rob*, Scott and I visited the Getaway Magazine Travel Show which was held in Somerset West at the Lourensford Wine Estate. It is huge, if you know what I'm saying. The goodie bag of unadulterated awesomeness we got at the door, including: a copy of Getaway Magazine which I have always enjoyed, countless flyers and advertisements (ok maybe not quite as awesome), a Bic disposable razor (could come in handy in a pinch, I suppose? ), some Holts Quick Wash & Wax (it adds a protective wax as it washes and lifts away road grime and corrosive deposits. I've been looking for a product just like this!!1! ), a Jungle Oats Energy Bar (yoghurt and berry flavour), a box of Imana mutton flavour soy mince and a sachet of dehydrated Turbo Energy. Friends, I am not making this up. Table Mountain had a booth at the show with a lucky draw for a set of return tickets to go up the mountain on the cable way valued at (I think) R360 (about $50). We all entered, and Scott won! Imagine our excitement. Scott has never been up the cable way here and we've been planning for ages to take a trip up. Sunday was one of the most perfect days I can remember there ever being of anywhere ever, and so we (and many tour buses of other people, and hiking mobs, and some buskers, a few casual vendors and some street kids) decided to head on up the mountain. During the World Cup soccer last year the Cable Cars got painted to look like large (they hold 65 people each) soccer balls. There's another remarkable thing about these large soccer balls: the floor rotates (don't worry, it is very gentle and at a pace that won't have you reaching for your gag bag). This means that everyone gets a fair turn at each piece of the view. Table Mountain is amazing for many reasons, and the first that comes to mind is its proximity to the city centre. It's only a few minutes drive from where we live, and teeming with unique plants and animals. When you walk across and away from the cable way it's almost impossible to believe that you're in the middle of a city. We got a little information booklet with our tickets and it explains that at 600 million years old Table Mountain is believed to be at least 6 times older than the Himalayas (though our mountain is old never let it be said that it is not with it: follow it on Twitter @TableMountainCA). According to the geologists it was formed under the sea and then forced up by tectonic movement, and was originally an island until the sea backed out and left it on dry land for us and the dassies to use. This is one thing I'd highly recommend visitors to Cape Town do, whether they choose to spend the 2 to 3 hours and hike up, or take the cable way. The scenery is phenomenal and if you venture away from the cable way when you're up there, a highly refreshing break to take. * Rob is our imported house pet who left us to go live on a boat. The couch is a much emptier place since he's gone. And our hearts. Shame. These are not every-day kind of footwear. You won't step out in these babies without making a screaming statement and demanding to be noticed. 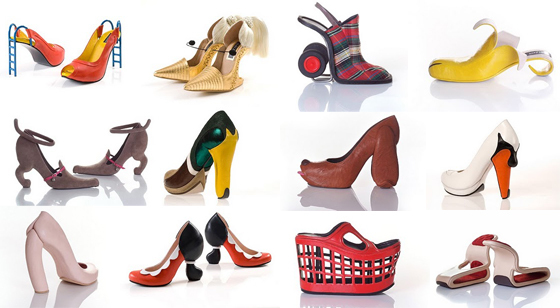 Kobi Levi is an Israeli designer who makes "artistic footwear". Really creative and really unique. He has lots listed on his site. Thank you Jen Walker for this. Consider my mind blown. I don't think anyone goes to Vegas for their own hitching without expecting something unexpected to go down. 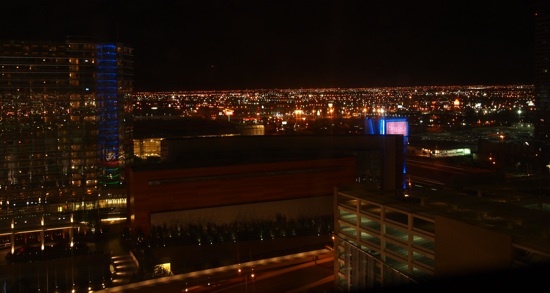 On our first night there, I sat in our plush hotel room looking down over a million tiny lights and thought, I wish Scott were here too. 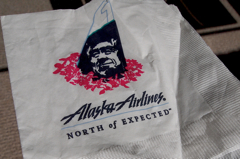 We chose to fly out of Bellingham in Washington State since it is a short drive to get there from Vancouver and that way we'd be taking a domestic flight instead of an international one. One the drive to Bellingham we stopped in for a cup of tea and a visit with Scott's Grandma McCleod. 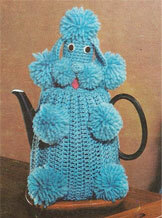 Her teapot was covered with a bright orange knitted poodle tea cosy like the one in the picture (except orange). I wish I'd taken a photo of it. It was nice to be able to visit her on our way into the States. All my grandmothers (I grew up with an above-average quantity of grannies thanks to multiple divorces and remarriages) have passed away and I have been lucky to acquire two really nice new ones through Scott. We looked at photos with her, and she told us what she'd been up to and gave us sandwiches. She is in her 80s but still extremely active and energetic. I hope that if I make it to 80 I am too. After our visit we drove over the border into the US. Part of our motivation for doing this was that I would be able to pick the new camera that I'd ordered (an Olypmus EPL1). Now, while driving over the border into the US will never be as scary and invasive as flying there, it is still a real ordeal to me as a South African without a fixed address or standard employer. After a stressful border-crossing where I'd gotten the hairy eyeball and I-don't-believe-or-trust-you series of questions from the border guard we tried to find the place that had my new camera, got lost and accidentally drove ourselves right back into Canada. Spot the bloody fools. To make matters worse, it was a different border crossing than what we'd come through earlier so the guards wouldn't recognize us, and we'd technically not actually crossed into Canada. We'd attempted to do a u-turn as soon as we realized our mistake and our u-turn threw us into no-man's land with the only option being to re-enter the country that we had never officially left in the first place. I hope this doesn't cause problems for me later on. Anyway, fortunately right when our new border guard was confusedly asking us WTF we were doing (which surprised me since it was not a difficult mistake to make and we can't have been the only people to have done this), there was a diversion a few lanes down with shouting and lots of running cops and a man standing next his car with his hands in the mothaf***kn air and all lots of drama and he (the border guard) just shook his head, threw our passports back into the car at us, told us to go and ran off to partake in the drama. I can't work out whether we were lucky or unlucky that day. I'm going to mark this one down as a neutral. Scott was well on his way to being Frankengroom. We panicked. I told him to phone his mom and ask what to do. He refused. I suppose we have different ways of problem-solving. After weighing up our options we decided that it was best for him to leave and go back to Canada where he could see a doctor without the risk of having to sell a kidney to afford the medical treatment. We explained our situation to the Alaska Airlines staff and they were beyond amazing and put him on a flight the next day at no extra charge, AND upgraded him to first class! And so it came to be that I took the flight on my own. As soon as I'd boarded and lacking the option to phone my own mother I explained to the flight attendant that I'm not a good air traveler. She was incredible. She put down what she was doing and chatted with me, just normal chit-chat, until I calmed down. After I'd been seated a while (but before take off) she came to check on me again. The woman who I was seated next to overheard that I was freaked out and after the flight attendant had moved on to deal with less needy passengers, she offered to hold my hand during take-off and landing! During the flight, the flight attendant checked on me a few times and came to feed me vodka. All of this was incredible, but she gave me something far more important that may just have changed my life: an explanation for the terrifying experience that I had in Argentina a few years back. Apparently, sometimes when a plane is coming in to land it can get caught in the jet stream of another plane in front of it and tossed around like a leaf. She said that she'd never been on a flight where that had happened but had heard that it was terrifying. I've yet to do any research on this, but oh my god how this has changed everything for me flying-wise. 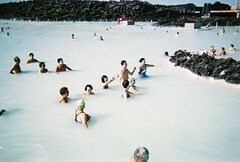 So between the kindness of the ground staff, a caring flight attendant and a warm American lady who held my hand I think I could get back into this and have started entertaining thoughts of all the magical places I'd like to see (Iceland please! Oh my hat, the prettiness). As well, given the option in future I will always, always pick this airline to travel with. But more on all of that later.